So the lovely peeps over at Meebox kindly sent over their latest box for me to review. This month's box was inspired by Rihanna, who is probably one of the most famous people to sport nail art on the regular. I tried to put together some nail art which incorporated all three polishes and would be something maybe Rihanna herself might sport. I haven't used the studs or the cuticle tattoos in this one just because I think they might have overwhelmed the look but I'll definitely be putting them to good use this festival season! 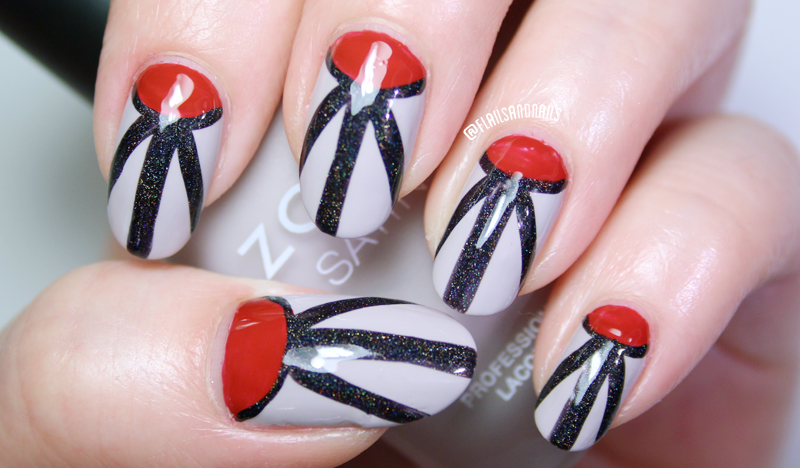 For the nail art I used Zoya Leah as my base. It took three thin coats for full opacity. It's a cool neutral shade, quite grungy but too dark. I like its semi-matte finish but of course you don't see it here because I applied a top coat. Next, I painted the half moon shape with Wah London Love My Team. Love My Team is a classic red shade, something Rihanna has sported many a time. I'm so glad I've finally got my hands on one of Wah Nail's polishes. My local Boots doesn't have a stand and I'm saving my points to buy some from the website. Although I didn't get using it this time, I reckon the long brush will make application really easy. Lastly, I use Danglefoot Polish Higitis Figitis to outline the half moon and add the additional stripes. I did this with a long striper brush. I love the subtle holo and shimmer of this polish. I can't wait to have it on my nails by itself. I sealed everything in with a customary lick of Seche Vite and here we are! You can get your own Meebox from the website here. They're priced at £20 month-to-month or you can buy a three month subscription for £54, saving 10%! 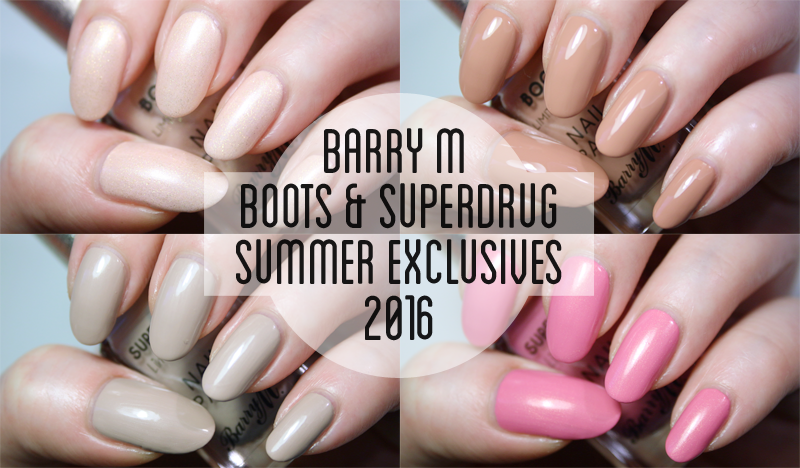 Every summer Barry M graces us with fab summer releases and a stable feature of these collections is the Boots and Superdrug limited edition releases. There are four exclusive shades available in Superdrug and Boots this year. In the past we've had neons, metallics etc but this year, it's all about that luxe, beach-ready mani. 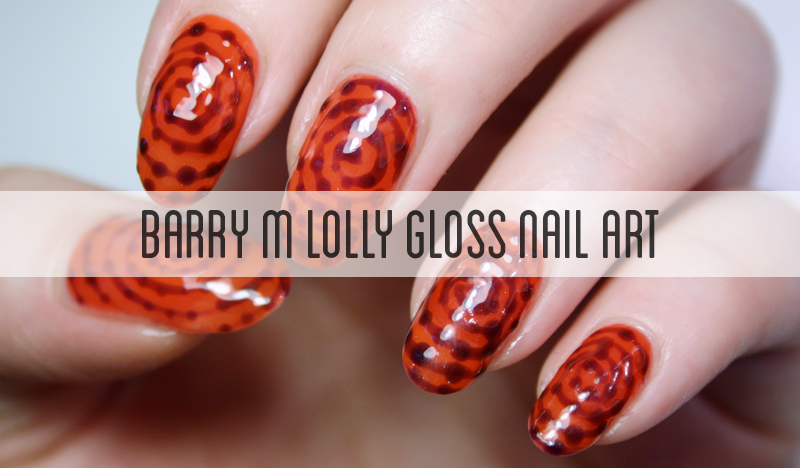 Hey guys, today I've put together some, well let's say random, nail art for you that shows off the new Lolly Gloss nail paints by Barry M. The Lolly Gloss range is a limited edition collection featuring four shades which dry to a sweet-smelling, super shiny finish. I've got Orange Fizz and Purple Pop to show you because the other two shades from the collection didn't make their way to me in one piece *RIP*. Anywho, I've never really played around with sheer polishes before so I was definitely intrigued when I first clapped eyes on these. I wanted to incorporate the lolly design which features on the bottle top into the design somehow. I did two coats of Orange Fizz (as recommended on the bottle). While the polish is sheer, it is not patchy after the second coat. Using a striper brush, I began to do the spiral design of the lolly in Purple Pop. It doesn't really matter if there is some unevenness in the spiral because I think it adds to the design and also, we will be adding dots on top. Of course, you could stop at the spiral but I thought it needed something more. Using a small dotter, I dotted Purple Pop at small intervals around the spiral. You can vary the size of the dots if you like but I just did it any which way LOL. 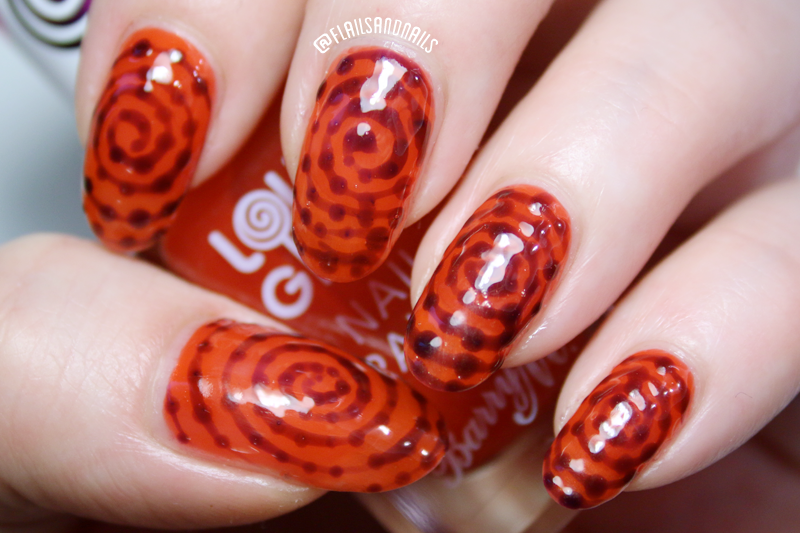 You can see how the dots look far darker than the spiral because of the sheerness of the polishes. After all that, top up with a top coat and you're set to go! It's a bit 70s, it's a bit Willy Wonka, it's a bit naff but it shows off the sheerness of the polishes me thinks. While I really like the Orange Fizz shade, I wouldn't wear the polish by itself because I'm not the biggest fan of my tips showing through polishes because they grow unevenly. If I had perfect natural tips, I'd definitely just wear the Lolly Gloss polishes as is but because they grow so funny, I'm a bit self-concious of them. I think these polishes are really meant for nail art. You can experiment a lot with these. Why not try a stain-glass effect, or cool sheer leopard print? If you missed the boat on OPI's sheer tints from last year (I think) then these are a good, cheaper alternative. It would be cool to see more shades in the collection but since it's limited edition, that's not likely I think. These new releases just keep coming and coming! If you follow me over on Instagram, you'll know I received all of the new Summer releases from Barry M. There are two new collections of polishes along with the usual Superdrug and Boots exclusive Summer shades. First up on the blog I've got swatches from the new Molten Metal collection which will become a part of the permanent range by the brand. If you're into your metallics, then stick around! So we all know I'm a BIG fan of Game of Thrones and there has been a time or ten where Game of Thrones has influenced my nail art. 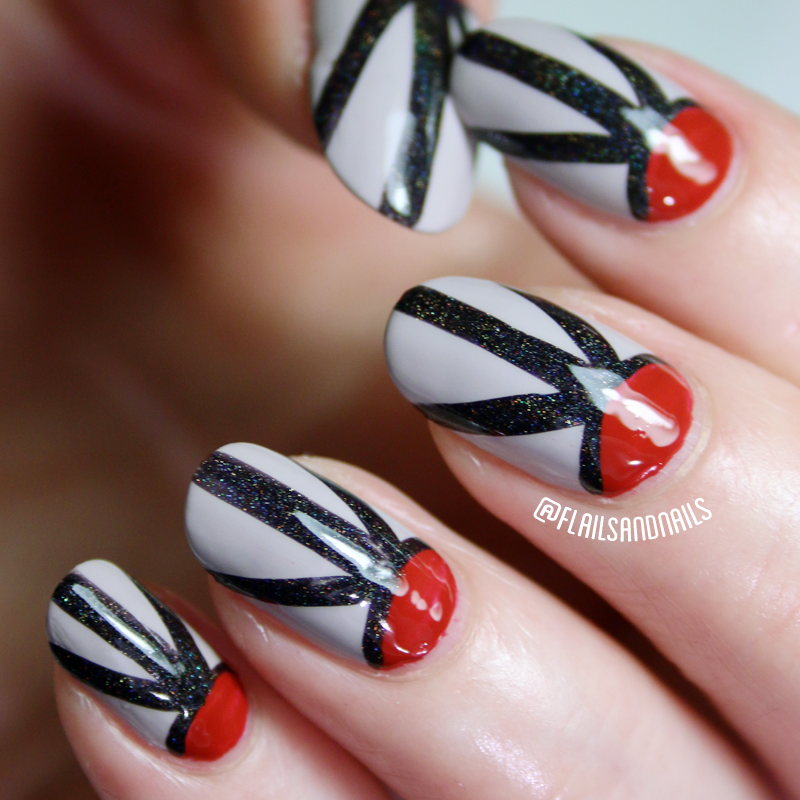 One of the main reasons I started this blog was to share nail art inspired by TV and film. I've kind of lost my way and motivation with the blog (I still post on Instagram and Twitter on the regular) but posting here has almost become a chore. 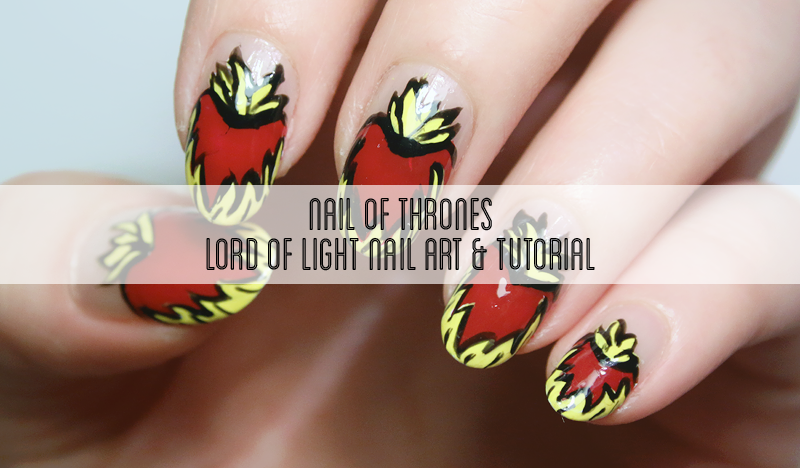 To challenge myself, I decided to try and create a nail art associated with each new episode of Game of Thrones. I know what you're thinking: Yeah Rebecca you've already kind of failed since we are on episode 2. Yes, you are right anonymous person BUT I did post my Episode 6x01 nail art over on Instagram because I had originally planned for that to my ~debut~ YouTube video but various circumstances meant I didn't get to film everything I needed for the video. The same thing has happened this week so instead of sitting on this nail art like last week's, I thought f*ck it and post anyway. I really do want to get on YouTube VERY soon but I'm still trying to figure out my filming set up, whether I want to film little intro/outros and actually discuss the episodes (let me know your thoughts below!) While I'm figuring out what the flip to do with YouTube, let's begin with the good ol' blogpost and some .gifs! Now, there will be spoilers in these posts. I'm sorry but I can't NOT talk about this so if you haven't seen this week's episode, either don't read the text and look at the pretty pictures OR head over to Instagram and have an ogle there. I'll not post spoilers there but I can't say the same for the comments below so travel there at your own peril or you know watch the episode! Anyway, let's talk about the episode and some actual nail art, yeah?